Harissa potatoes would be perfect with eggs on a Saturday morning, or as a dinner side with roasted chicken. You could serve these as part of a meze, a selection of small dishes to make a meal, in the same way tapas are served in Spain, or, as we American’s might enjoy small plates dining. These potatoes are lovely served warm or room temperature with a tomato salad, tzatziki, and a good home made hummus. We have been enjoying the flavor combination of sundried piments, extra virgin olive oil, garlic, sun dried tomatoes, coriander and caraway seeds in a traditional harissa paste which is hand made in Tunisia. Harissa is a hot sauce (or paste rather) used in North African cuisine, made from chili peppers, spices, and olive oil. My store bought harissa paste adds a delicious flavor to bland foods such as chickpeas, carrots and potatoes. Although I haven’t made my own harissaa yet, John fromthebartolinikitchens’ has a recipe you could try. Visit his post to learn more about harissa and for a wonderful chicken thigh recipe too. Recipe slightly adapted from Herbivoracious. Heat the olive oil in a medium skillet over medium-high heat. When the oil is shimmering, add the onion and cook for 1 minute until it begins to soften. Add the potatoes, harissa, preserved lemon, cumin, and salt and cook, stirring occasionally until the potatoes are lightly browned on the outside and tender in the middle. It helps to cover the pot so that the tops of the potatoes are steaming a bit while the bottoms are browning. Uncover for the last couple of minutes. To serve, taste and adjust seasoning. You might need more salt, harissa, or preserved lemon. Transfer to serving plate and garnish with the feta cheese and a very generous amount of fresh dill. What a lovely dish, Seana.. I have to admit, I’ve never tried harissa. I have a feeling that I’d like it very much…and instead of going out to buy some, I think I will hop over to John’s to check out his recipe. 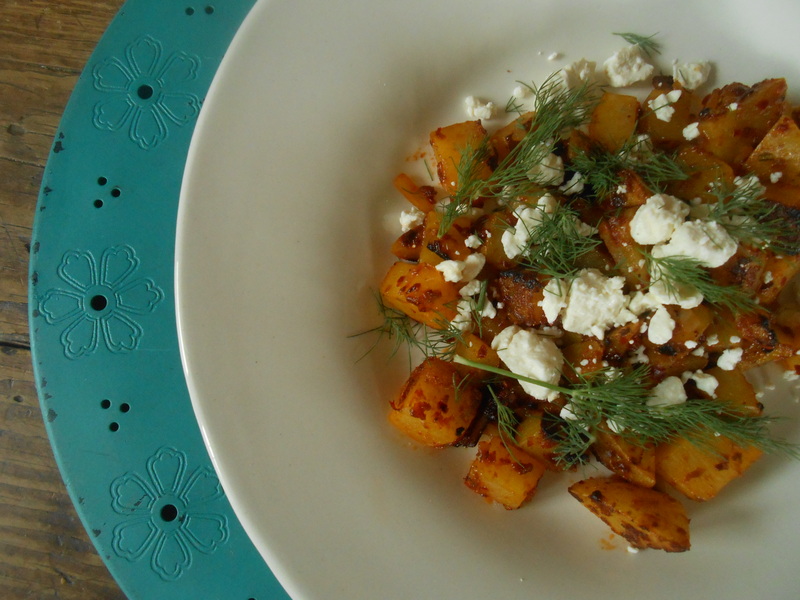 I do love the combination of the potatoes, with the cumin, feta, and dill though..that sounds so fabulous! I will be trying this again very soon! Thank you …. have you cooked with harissa? If now, I think you would love it. What a great dish, I can see this served with so many different kinds of foods. Checked out John’s homemade harissa and it looks amazing, will be making some myself. Thanks! Hi Nancy. John’s post was so inspiring and I really was looking for a harissa recipe because my stock was slowly dwindling. I can’t believe how expensive it can be to buy and you know how everything tastes better home made anyway. Hope you try it…such vibrant flavors you will love. My favorite “healthy” snack is to take a can of chickpeas, mix them with some harrisa oil, garlic powder, salt and pepper and bake them until crunchy (usually about 30 minutes at 350 or so). But harrissa and potatoes is a darn close second! Sounds like that would be my favorite treat too! Oh my goodness. I love crispy chickpeas and I love smoked paprika on mine…I actually crave them. Love your idea too. I’ll have to do them this way next time…which will be soon, I’m sure. I think I may have to try these, they look delicious. I don’t have harissa paste but dried spice. I find it odd but I did get it at williams sonoma…so I don’t know. Just different I guess. I find that a bit odd too! Well more interesting than odd…William Sonoma? So it’s a harissa dried spice. I bet it good, actually. Bet you could use it just as a paste. You are right – I bet these potatoes go great with eggs. We didn’t have them with eggs…but I think I’ll be making them this coming weekend with eggs. Sounds like a good breakfast to me! Wow cottage girl! These look perfect for Sunday brunch! Yummy potatoes and yes they would be amazing with eggs for breakfast, lunch or dinner. Delicious!! Great! I want to make harissa. I am a bit head over heels about it these days. I love harissa, and the potatoes look amazing! Try leftover harissa on salmon! I will. Never thought about using harissa on salmon but now that you mention it I bet it’s fantastic. Especially if you get a nice crust about it. I’ll try it for sure. Thank you for the idea! :) Thank you for stopping by and reading! Hells yeah. North African patatas bravas!! Effing love it! Ah! I just realized it’s an American saying. It comes from an old cereal commercial…it’s sort of a joke. I love soup made with harissa so am sure I will love these potatoes too. There are many variations of a Moroccan soup/tagine made with harissa and lamb. For a vegetarian take I’ve tried this Ottolenghi recipe: http://www.theguardian.com/lifeandstyle/2008/apr/26/recipe.foodanddrink , or added harissa and Moroccan spices to a tomato soup. Hope this gives you some ideas? Another winner! I have set John’s harissa recipe aside to make too, sooner now, i have the incentive of making these spiced up spuds! I have been thinking of John’s recipe since I saw it. I love harissa and I can’t seem to get to the bottom of my store bought paste, which it fine because it really is wonderful. The spuds are good. Hope you make them! I have never had harissa, but it looks like something I would enjoy. Thank you for teaching me about something new! I just love potatoes and this dish would be sure to please. Me too. I could eat them with salt only and be satisfied. :) But, the harissa really is fabulous. Must make John’s harissa soon! Thank you! Love spicy flavor with potatoes. This is the first time I have made them with a spice combination other than a Mexican type spice, which is wonderful too. I love potatoes! Potatoes and harissa, great great combination Seana :) We have always at home harissa (and bread) on the table. You should try to do a home made harissa! I certainly will be trying John’s harissa recipe soon. I like you always have harissa (and bread) on your table. So delicious and something I would always look forward to at meal time. More uses for Harissa – I’m convinced that I need to make some of this gorgeous spicy paste and start enjoying it too! Thanks for this great recipe Seana. The more uses for harissa, the better, right? Do whip up a batch because apparently it is wonderful on bread too! So, what I’m finding is I have been missing out all these years on a wonderful harissa paste that many other cooks have been using quite often on all kinds of wonderful foods. I’ve been roasting potatoes with harissa and, though they’re a nice change from those roasted with olive oil and rosemary, mine were lacking something. Your addition of feta, lemon juice and cumin is just what mine need. Love, too, the idea of serving them with a bit of tzatziki on the side. Thanks for the inspiration, as well as for the shout-out. That was kind of you. I think you are right. I imagine the potatoes without the lemon (or lime) feta and cumin and it just wouldn’t be the same at all. You actually really inspired me with your harissa posts John because I have only recently discovered it and really enjoy the flavor. Do you like sun dried tomatoes? Perhaps one of these days you can add a little to your home made harissa and let me know what you think. The paste I have has a very slight sun dried tomato flavor so I know not much was added. It’s wonderful. That’s a great idea and I will give it a try. Thanks for the suggestion. I’ll let you know. Yes, very addictive and you now how stuffed you feel after you eat too many potatoes! Hard to stop. Such lovely spicy flavors, perfect for potatoes. I think you are right, we do share a similar palate. I just love your posts (photographs and recipes!). I never read your posts in my reader, I have to click on “view original” and go directly to your blog to get the full experience! Yes – homemade preserved lemons, something I need to make too. Did you see Amanda’s post? Yes, I saw that! I had already made mine back in December (following a recipe video from Food52), but Amanda’s photos were inspirational, as usual. Now I think I’ll make preserved lemons an annual project! So nice to see your presence again Danny. I hope you are enjoying yourself in Hong Kong. Looking forward to seeing some posts from gotaste…. Harissa is one of my favourite spice blends. I hadn’t thought of putting it on potatoes – I must try this – thanks for posting! I love harissa too! I am just realizing how many foods harissa complements. Hope you give it a try it’s wonderful on potatoes. It seems that during my week off from the blog I missed a lot of recipes… finally I’m here…. How could I miss this recipe??? I love the simplicity of this recipe, I’m sure the taste has to be amazing! thanks for sharing! Did you say “to have with eggs”? Another wonderful recipe then that I must attempt for consumption. And to think, I had crumbled feta in my hand yesterday at the store but thought… nah, next time, I’m not feelin’ in today, ahh! You are currently reading harissa potatoes at COTTAGE GROVE HOUSE.